Tag Archive | "Puntius ticto"
The Odessa Barb (Puntius ticto) is also known by l enthusiasts as the Scarlet Barb or Ticto Barb. 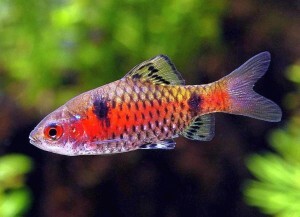 Native to South East Asia, the Odessa Barb‘s native region includes Bangladesh, Bhutan, China, India, Laos, Myanmar (Burma), Nepal, Pakistan, Sri Lanka and Thailand. Puntius ticto live in the upper Mekong, Meklong, Irrawaddy, Salween and upper portions of the Chao Phraya basin. Male Odessa Barbs are black to silver in color with a beautiful bright red stripe that runs horizontally from the head to the caudal fin. Females are silver and pink with a black spot above the pectoral fin. driftwood , but leave plenty of space for the fish to swim. Because they are a schooling fish, they should be kept in groups of at least 6 specimens. Odessa Barbs are constantly in motion and should not be housed with slower moving fish. They may nip the fins of larger slower moving species. Breeding Odessa Barbs is a matter of placing a number of specimens in a tank until they begin to pair off. When a pair develops, the female will start laying eggs while the male follows behind her fertilizing them. Some Java Fern should be placed in the tank to provide the fry with hiding places when they hatch out. Once hatched the fry will be free swimming in 5 to 6 days, at which time they should be fed newly hatched brine shrimp until they are large enough to be fed a quality crushed flake food. Mature Odessa Barbs should be fed a quality flake food with frequent supplements of live, frozen, or freeze dried bloodworms, brine shrimp, daphnia, tubifex, mosquito larvae and vegetable matter. 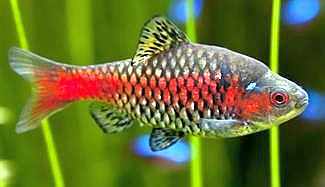 Odessa Barbs are usually 1″ to 1-1/2″ when available for purchase in tropical fish shops.